Don't throw away your unfinished cigarette, store it in our Cig Cache. Solid metal with polished chrome finish, this storage device is designed to look and feel like an expensive lighter. 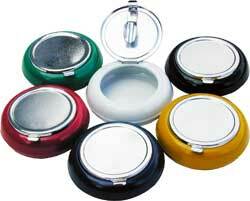 Lid flips open for easy storage and removal. Comes with a black 14" loop cord for easy hanging. Prefect inexpensive gift.